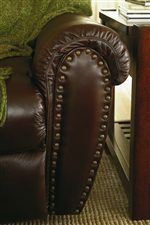 Traditionally designed with a leather draping and timeless nail head trim, this swivel recliner will compliment your home in both comfort and style. 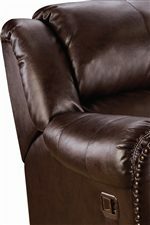 A comfy concoction that is stylishly sophisticated, this leather recliner features over-stuffed seat cushions, and contoured seam lines, emitting a cultured look that boasts quality tailoring. A richly designed piece with trends towards age-less luxury, this living room swivel recliner makes a grand addition to TV and conversation rooms. The Summerlin Glider Recliner W/Swivel by Lane at AHFA in the area. Product availability may vary. Contact us for the most current availability on this product.